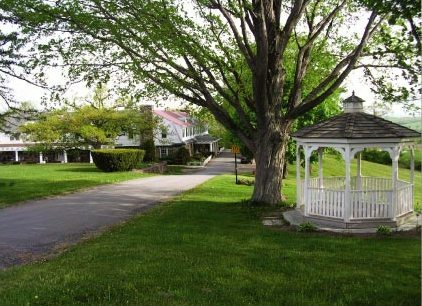 _________ The Warwick Center is a 465 acre hilltop estate on the outskirts of Warwick, NY, a beautiful area at the entrance to the Hudson Valley just 50 miles from New York City. The site offers expansive panoramic views in all directions of the Shawangunk Mountains and the Warwick Valley. Bedrooms are in the gracious older East Building and the newer air-conditioned West Building. There are 8 miles of hiking trails, a swimming pool, and tennis courts. Vegetarian and non-vegetarian meals will be provided from Friday dinner through Sunday lunch. If you have special dietary needs, we will have the use of a small fridge to store some items. Please let us know in advance if you will need to use that fridge. Certain rooms and plans are very limited in number, and Warwick Center requires ADVANCE NOTICE to guarantee accommodations. Therefore, it is important to register early!